Hydrology is the science of the movement of water through the atmosphere, on the land surface, and underground. It includes the study of the physical, chemical, and biological interaction of water with the rocks and minerals of the Earth, as well as its critical interaction with living organisms. Hydrologists study the physical, chemical, and biological properties of fresh water. 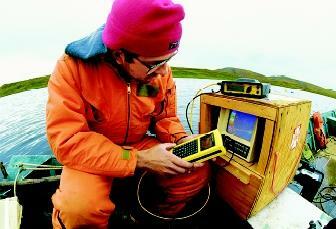 This hydrologist tests Alaska's Toolik Lake for contamination. environmental protection; ecosystem studies; and construction of dams and roadways. Hydrologists find career opportunities in private business and industry; consulting firms; local, state, and federal agencies; agriculture; forestry; academia; and research-related institutions. Water management issues, whether related to availability of water or the protection of water quality, have evolved to a more comprehensive view of the relationship between land use and water use. Hydrologists play a key role through fundamental data collection and analysis, resource evaluation, and participation in developing regional or watershed water resource management plans. Academic preparation for a career in hydrology should include mathematics and science in high school. At the university level, hydrology courses are usually taught in the geology, geography, or civil engineering departments. In addition to these disciplines, academic training in biology, physics, chemistry, mathematics, and computer science is desirable. Many universities offer undergraduate and graduate degrees in hydrology. The completion of a graduate degree in hydrology will continue to offer the greatest career opportunities. SEE ALSO Chemical Analysis of Water ; Data, Databases, and Decision-Support Systems ; Drought Management ; Ecology, Fresh-Water ; Erosion and Sedimentation ; Floodplain Management ; Groundwater ; Groundwater Supplies, Exploration for ; Hydrogeologic Mapping ; Lake Health, Assessing ; Modeling Groundwater Flow and Transport ; Modeling Streamflow ; Stream Hydrology . Careers in Hydrology. Universities Council on Water Resources. <http://www.uwin.siu.edu/ucowr/hydro/h13.html> .